Spring has arrived and so has the 30th Anniversary of the Canadian Nuclear Society. We include in this edition of the Bulletin a report on the special session of the extended council held to collect thoughts and opinions about the CNS, its values and vision, which sets the building blocks for a new strategic plan that looks to where we want to go. Fred Boyd describes the 30-year history of the CNS, which looks at how we got to where we are. Also of the "30th Anniversary" category is the accident at Three Mile Island. We have taken a look back at the perceptions at the time and reveal how an interesting sequence of learning events took place. We learn that popular perspective, although convenient, is not always correct and things may not be as they seem. Also, after the ditching of an aircraft on the Hudson River, we understand better the difference that a good operator can make. 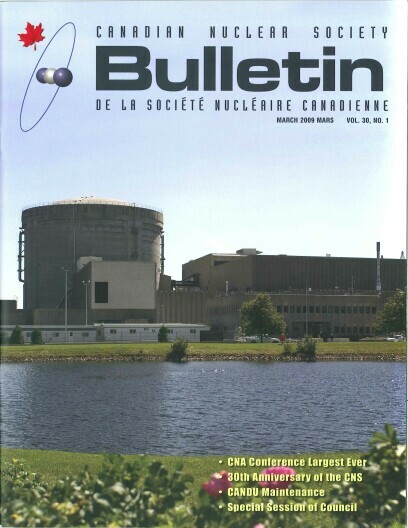 Neil Alexander continues to write about the readiness of the CANDU industry and we have two conference reports - the CNA's 2009 Nuclear Industry Conference and Trade Show (largest ever!) and 6th Annual Conference of Women in Nuclear (WiN). There are three technical papers on CANDU Maintenance and the regular news sections. And always provocative and entertaining, Jeremy Whitlock offers a dark and chilling tale in Endpoint. We hope you enjoy! As always, letters, articles and comments are welcome.